Q: How do I add a new device into the app? A: On the “All Devices” screen press the + sign at the bottom. Q: Can I combine devices from my different homes in one app? A: Yes! 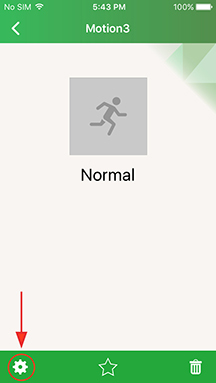 If you are putting devices in different geographical locations then you can access them all within the Simple Home App without switching between locations. Here is a good place to use groups to separate the different locations, like Home and Vacation Home. Q: My device is not powering on, what should I do? A: If your device has a power cord, make sure cord is plugged in fully to both the device and to the power outlet. Q: How do I turn off notifications for a device? 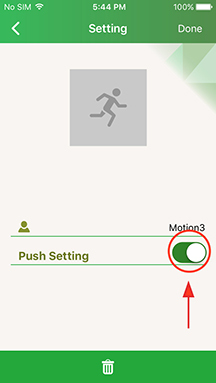 A: Go into the settings of the device and switch the “Push setting” to off. A: The most likely problem is that your home network is set to the 5ghz frequency. SimpleHome devices only work on the 2.4ghz frequency, so check your router settings. Your internet service provider should be able to set it up for you if you contact them. A: 1. Look in the manual for that device for where the reset button is. Most have a button that you will need to push, some require a small pin. Hold the button down for at least 8 seconds. 2. 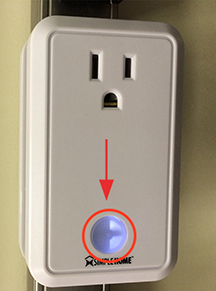 If you have the door sensor, take out the batteries and walk to an area your home Wi-Fi dosen’t reach (you can also simply turn your router off for a moment), then put the batteries back in. 3. If you have the LED bulb, turn the bulb on and off 5 times. Wait for the bulb to turn on fully before switching it off each time. After the 5th time, wait a moment, it should dim off and back on by itself. That lets you know it was successfully reset. A: This is because your phone wants to connect to internet so when connecting to the device, its unable to access the internet, so it automatically switches back. Either try forgetting your home network for minute (or any known Wi-Fi networks in your area), or keep repeatedly clicking the device network until it sticks. Q: Can I delete videos that my camera has taken? 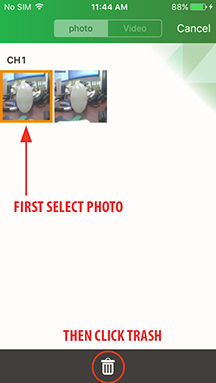 A: If the video or picture was taken manually from the live view screen, then yes! 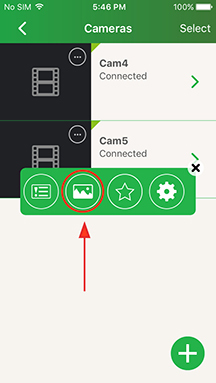 You can delete them right from the app by clicking the circle with the three dots in it on the camera’s icon before you enter live view. 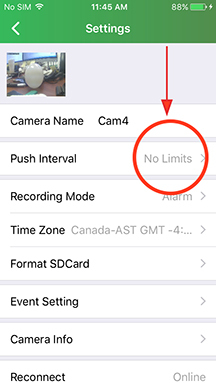 If the video was taken automatically by motion triggered event recording, then no, the only way to delete those at this time is to either do it on a computer or format the whole SD card from within the app. Q: Can I get notifications sent to my email? A: No, at this time push notifications are the only way to receive alerts. 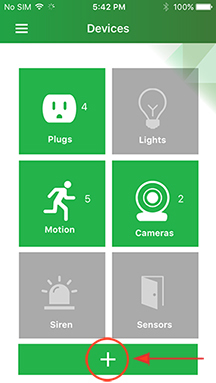 Q: I am in the Simple Home app on my iPhone and watched someone walk in front of my sensor but I did not get a notification! A: At this time iphones will only receive notifications if the app is not open and in the front. Q: I am getting too many notifications! 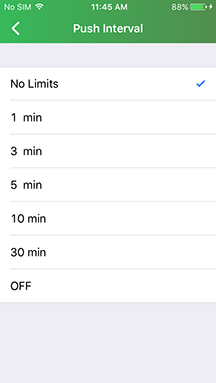 A: If you have a camera, you can go into the camera settings and change the interval of notifications so that you only get a notification once every few minutes. If it is a different device, you can go into the device settings and turn the “Push setting” off. Q: Can I view my camera from my computer web browser? 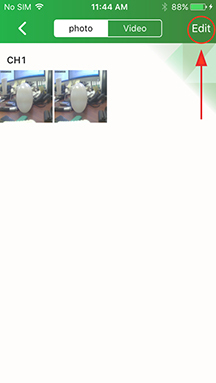 A: No, at this time we do not support camera view from web browsers. Q: Can multiple people use the same device? Do they have to be added separately on each individual phone? A: Yes, multiple people can use one device. No they don’t have to be re-added. 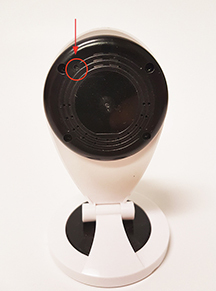 If more than one person wants to use a device from a different phone, just have them log in with the same credentials that was used to first setup the camera. Q: My device says it’s bound to another user! A: Please fill out our Customer Service Questionnaire and make sure to include the UID of the device. We will internally reset it for you and email you with a confirmation. A: We are always here to help! Simple Home warrants its products for ONE YEAR against defects in manufacturing under regular consumer use with original receipt of retail purchase. We believe in our products and want to provide you with a replacement, if needed, but we have to know about the problem while the product is still under warranty. If you discover a defect covered by this warranty, please contact us about receiving a replacement. In order to use the products warranty the customer must provide proof of the retailers receipt. Simple Home’s warranty is limited to our products only. Our warranty does not cover the replacement or repair cost of any third-party accessory, electronic device or personal property.